The Regional English Language Office (RELO) of the U.S. Embassy in New Delhi is pleased to invite scholarship applications for three separate online courses for English language professionals. 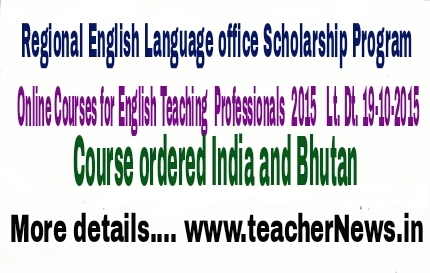 These courses will be offered by universities in the US, and they are designed to improve the quality of English language teaching in India and Bhutan. 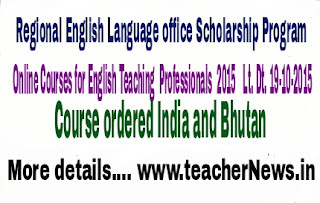 Selected participants will be Indian or Bhutanese English teaching professionals who are able to demonstrate their potential to become leaders in the field of second language education. Participants will use innovative online learning technology to interact with U.S. experts. Be highly motivated English teachers or ELT teacher trainers who are dedicated both to their own professional development and to sharing the knowledge gained with colleagues through workshops or professional presentations. Have the level of English necessary for a typical university-level course at American universities. Have regular and dependable access to the Internet. Be willing to commit up to 12 hours/week throughout the 8-10 week courses to complete necessary assignments. Have a good familiarity with the Internet and web browsers. Be able to type in English well enough to perform on-line tasks in real-time and to submit written assignments in a timely manner. Downloadable or posted syllabi, assignments, and course readings. Asynchronous and some synchronous contact between instructor and participants, between other experts and participants, and among participants. Lectures via real-time, text, or audio-enhanced text. Use of an online bulletin board to post notes, assignments, and feedback. Information on additional web-based resources. Emphasis on a learner-centered approach. Formative and summative assessment components. The scholarships offered by the U.S. Embassy, New Delhi, will cover all course fees. Please note that the scholarship does not cover the cost of computer purchase /rental or Internet service fees. Participants who successfully complete the course will receive a certificate from the university. If you are interested in competing for a scholarship, please send a completed copy of the application form by the deadline to Shweta Khanna at KhannaS@state.gov with a copy to Vimal Raswant at RaswantV@state.gov.